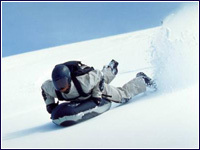 Airboarding is an activity similar to body boarding. You lie on an inflatable tube and glide down a steep hill at 60 miles an hour. No matter how athletic you are you can join in on this activity. This sport was created in Europe by a Swiss inventor by the name of Joe Steiner who started 10 years ago and since then has grown to be a very popular sport in Europe. A majority of resorts that offer airboarding are already giving lessons to younger children and this will just continue to grow. While there are not many different tricks that are known for airboarders it won’t be long before they are invented. Just imagine how many tricks you can do on a snow board, while the idea is not to stand on your airboard, it is quite similar in a way. For example, you may go on half pipes and off jumps with your airboard, and believe it or not at 60 miles an hour, you’ll fly. The obsession of going to the slopes with your airboard sounds like anything else, boring after a while. I have a feeling this is going to take a much bigger approach. If you’re a snow lover, enjoy the outdoors, and love being at the slopes, then I couldn’t picture you not airboarding. Obviously people that haven’t tried it yet won’t know what it is, but once it gets out many people will want one. Five resorts in the USA are already allowing airboarding and this winter might be the biggest for this activity as it will grow in popularity. Hopefully other resorts see this as a great business opportunity and join in on the fun. Unlike snowboarding, airboarding doesn’t require a lot of equipment and it’s very easy to learn. A few things to know about airboarding are the ability to glide using an inflated tube, the possibility of landing a 4 foot jump into a soft snow drift, and an injury rate much lower than snowboarding. So far the airboard is pretty plain and not much has been done to evolve it into a really awesome “thing”, but with time look for extras to be added on to it. Although this might be a fad, I believe it will take a different route. Airboarding will be known as a winter sport so once winter is over, owners will pack there boards up and store them away until next winter. After a few months you will want to get back on the slopes. Other fads that are available all year round usually just drop out of their popularity zone and you hardly hear from them again. Airboarding will be something that everyone will look forward to if it continues to grow like it has.